While I use this recipe as a healthier version of the classic stuffing for Thanksgiving, I also make this year-round as it's great as a side dish to any meal or even mixed in with eggs as a breakfast skillet! I also love throwing this in with mixed greens and balsamic glaze for a savory salad. Hope you enjoy! Cook wild rice according to package but replace water with broth. 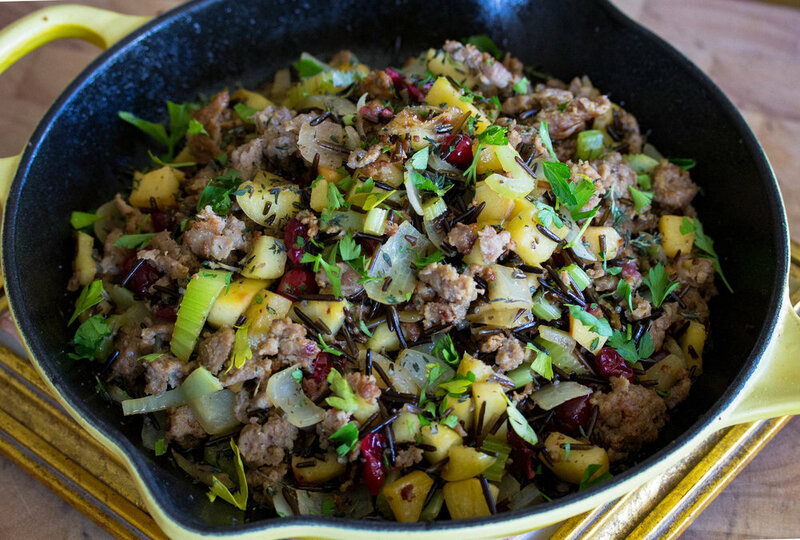 In a skillet, brown sausage in 1TBS ghee until medium cooked. Add another TBS of ghee and then add the celery, onion, rutabaga, apple, salt, and pepper and cook for another 2-3 minutes. Add cranberries and wild rice and cook until cranberries just barely begin to pop. Season with chopped parsley and thyme.